Conrad, T.A. 1838. Monography of the Family Unionidae, or naiades of Lamarck, (fresh water bivalve shells) or North America, illustrated by figures drawn on stone from nature 1(10): 81-94, pls. 46-51. Conrad, 1838, Monogr. Fam. Unionidae: 82, pl. 45, fig. 2. Reeve, 1864, Conch. Icon. : pl. 12, sp. 43. Conrad, 1834, New Fresh-Water Shells: 69. Conrad, 1838, Monogr. Fam. Unionidae: 88, pl. 48. Reeve, 1864, Conch. Icon. : pl. 14, sp. 56. ‘Lea’ Conrad, 1838, Monogr. Fam. Unionidae: 92, pl. 50, fig. 2. Conrad, 1838, Monogr. Fam. Unionidae: 89, pl. 49, figs. 1-2. Conrad, 1853, Proc. Acad. Nat. Sci. : 255. 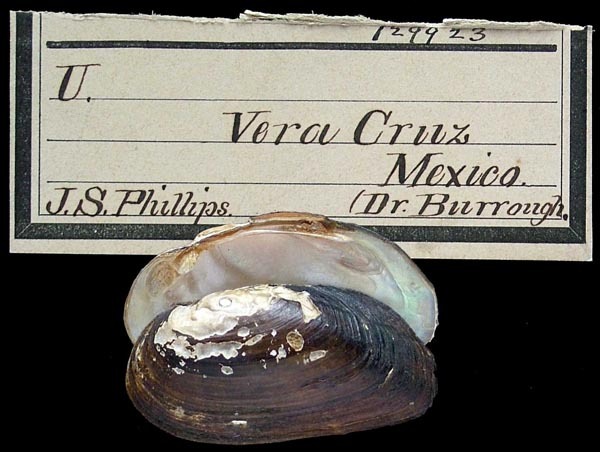 Type(s): LECTOTYPE ANSP_129923, Vera Cruz, Mexico. Conrad, 1838, Monogr. Fam. Unionidae: 83, pl. 46, fig. 1. Reeve, 1864, Conch. Icon. : pl. 12, sp. 45. Conrad, 1834, Amer. J. Sci. : 339, pl. 1, fig. 6. Conrad, 1834, New Fresh-Water Shells: pl. 7, fig. 1. Conrad, 1838, Monogr. Fam. Unionidae: 91, pl. 50, fig. 1. Conrad, 1853, Proc. Acad. Nat. Sci. : 258. Unio lienosus variety constrictus Conrad, 1838. Conrad, 1838, Monogr. Fam. Unionidae: 91, pl. 49, fig. 4. Conrad, 1838, Monogr. Fam. Unionidae: back cover correginda [as ‘Unio constrictus’]. Conrad, 1853, Proc. Acad. Nat. Sci. : 247 [as ‘Unio constrictus’]. 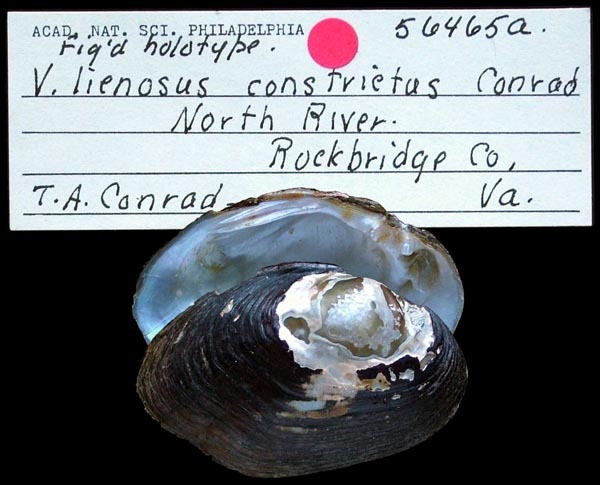 Type(s): HOLOTYPE ANSP_56465A, North River, Rockbridge Co., Va.
Unio acutissimus Lea, 1831. — Conrad (1838: 86). 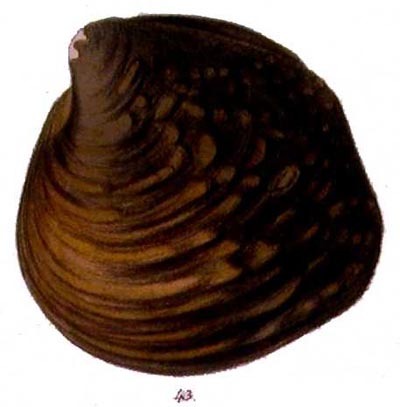 Unio bullatus (Rafinesque, 1820). — Conrad (1838: 82). Unio conradius [sic] Lea, 1834. — Conrad (1838: 87). Unio constrictus Conrad, 1838. — Conrad (1838: 91). Unio dromas Lea, 1834. — Conrad (1838: 84). Unio hembeli Conrad, 1838. — Conrad (1838: 93). Unio heterodon Lea, 1829. — Conrad (1838: 90). Unio interrupta (Rafinesque, 1820). — Conrad (1838: 88). Unio patulus Lea, 1829. — Conrad (1838: 92). Unio plexus Conrad, 1838. — Conrad (1838: 89). Unio stegarius (Rafinesque, 1820). — Conrad (1838: 83). Unio stramineus Conrad, 1834. — Conrad (1838: 91). Unio subtentus Say, 1825. — Conrad (1838: 85).